It’s almost time for spring cleaning! Get your papers shredded. Don’t let old documents put you at risk for identity theft. St. Mary’s County’s Department of Public Works is planning a free document shredding event for Saturday, May 4, 2019, from 8 am to noon at the St. Andrew’s landfill. The landfill is at 44595 Old St. Andrew’s Church Road, California, MD 20619. Community shredding events can help protect you and your information. The community event provides residents an opportunity to shred their confidential, private, and important documents at no cost. 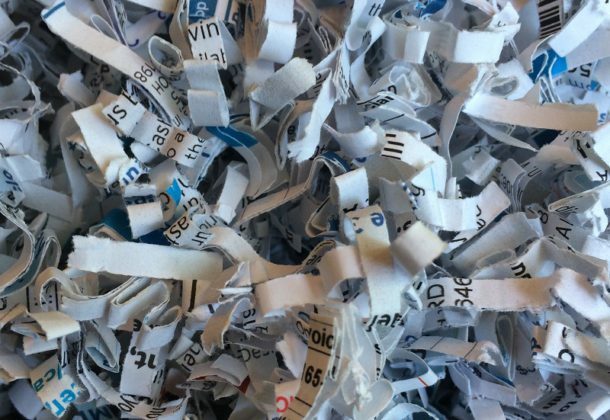 The shredder truck is capable of holding approximately 12,000 pounds; turning sensitive documents into confetti-sized pieces. This type of shredding ensures confidential material cannot be copied. All paper material shredded will be recycled. Residents are asked to refrain from bringing materials which are not confidential in nature, such as newspapers and magazines (these can be taken to one of six convenience centers around the county). This will cause the truck to fill up more quickly. The shredder can handle simple staples, paper clips, spiral note books and thin metal prongs; however it cannot accept three-ring binders. Please limit the number of boxes you bring to three standard bankers’ boxes (10″H x 12″W x 15”D) per person so we can serve as many residents as possible. A total of 11,060 pounds (5.53 tons) of paper was collected from 286 vehicles at the last event held on Nov. 3, 2018. For more information about this event, please contact the St. Mary’s Department of Public Works and Transportation at 301-475-4200, ext.73550. For more information on recycling programs, log on to the county’s website.